The identity and access management (IAM) market is shifting and changing quickly right now. As more organizations make the shift to the cloud, a new generation of identity management tools is emerging. Just as importantly, there has also been a rearranging of the categories to change the IAM landscape even further. In this post, we’ll discuss the cloud directory feature identity bridge. Before we can talk about what an identity bridge is, we need to step back and briefly review the changes in the directory service space. Tim Howes and his colleagues at the University of Michigan kicked off the modern era of identity management with their invention, the Lightweight Directory Access Protocol (LDAP). Before LDAP, the X.500 and the Directory Access Protocol (DAP) made up the directory services for organizations. This setup worked okay, but it had a few challenges. It required a lot of computer processing power, and implementing a DAP stack required a good amount of customization. Then resources started to utilize TCP/IP, and the need grew even more for a lighter weight directory services protocol. That’s when Howes and his colleagues stepped in and created LDAP (OpenLDAP.org). LDAP worked so well that it spawned a number of products that would go on to make directory services a staple among IT organizations. The most notable directory services are OpenLDAP™ and Microsoft® Active Directory® (AD). While both of these products would go on to become market leaders, AD became the monopoly in the space. Then, Active Directory started to experience what happened to the X.500 – change in the world of IT. Many new IT resources brought significant change to an organization’s network. Mac® and Linux® machines became more common. Web applications joined on-prem applications within the environment. Data centers gave way to cloud infrastructure hosted at AWS® and Google Cloud Platform™. Files stored in Windows® File Server started to shift to the cloud, or cheaper alternatives such as Samba file servers and NAS appliances. All of these changes put massive pressure on the core identity provider for an organization which was usually Active Directory. IT admins knew that AD has been tuned to work with Windows machines and applications that are located on-prem. But, clearly, that’s not how the IT network has been evolving. In response to the shifting network, IT admins started to need directory extensions or identity bridges as they are often called. The identity bridge integrates with Active Directory to extend an identity to non-Windows resources that are located on-prem, in the cloud, or remotely around the world. Ideally, this identity bridge would be a cloud-delivered service rather than on-prem. The concept of a cloud identity bridge would be a big help because it would allow an organization to leverage their existing investment in Active Directory, while still being able to shift to modern cloud and web services. 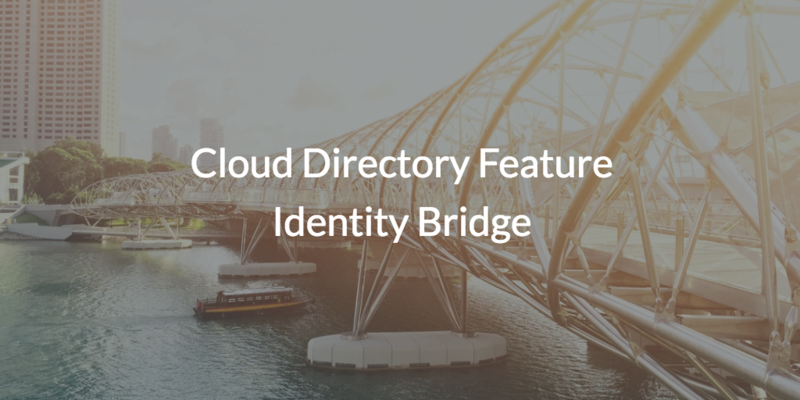 The cloud directory feature identity bridge is exactly that and saves IT admins significant time and resources. They don’t need to install more on-prem hardware and software or manage more infrastructure. Yet, they get the benefit of leveraging their existing directory service to control access to modern resources. You might be wondering if a solution like this even exists. The answer is yes, and it’s called JumpCloud® Directory-as-a-Service®. When JumpCloud’s AD Bridge is utilized, IT admins can extend AD identities to non-AD bound IT resources. This means you will be able to centralize user access to Mac and Linux systems, cloud servers, web-based applications, WiFi networks, and Samba-based file storage. Additionally, IT admins are able to reduce identity silos, manage remote employees more efficiently, and provide remote employees with an improved workflow for accessing their IT resources. 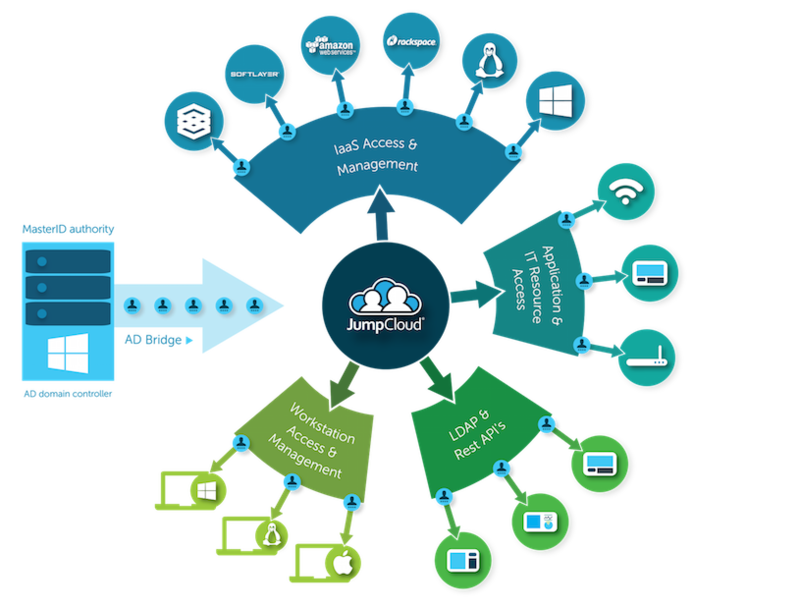 When the time comes to move all of your identity management infrastructure to the cloud, JumpCloud also integrates with resources like Windows systems, on-prem applications, local servers, and wired networks. So, whether you’re looking to eliminate Active Directory or extend it to modern IT resources, JumpCloud can help you centralize and secure your IT environment. If JumpCloud Directory-as-a-Service sounds like an intriguing solution, we hope you’ll drop us a note. If you’re ready to get straight to testing the cloud directory feature identity bridge, sign up for a free account. You’ll be able to test all of our features, and your first ten users are free forever.